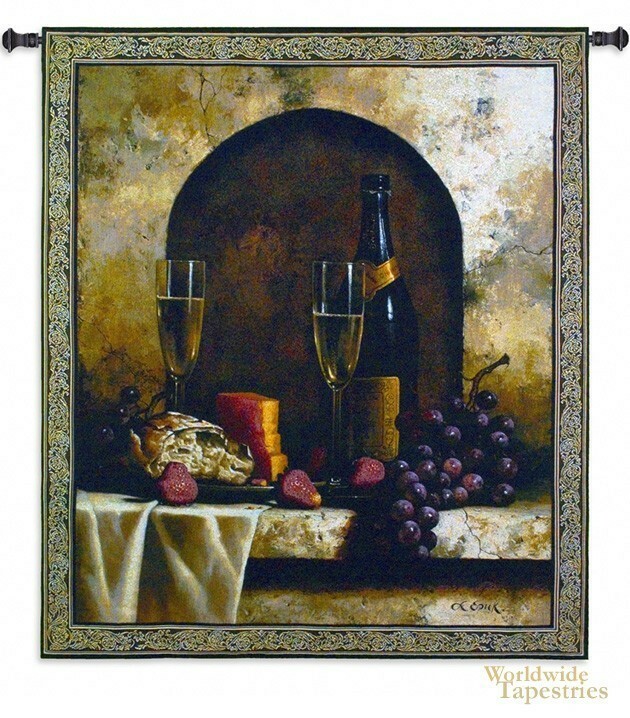 This tapestry "A Date To Remember" shows a still life arrangement of grapes, wine and cheese by artist Loran Speck. Here we see a rich and sumptuous feast for a date in a setting that is reminiscent of a country European setting. The work of Speck is renowned for its use of rich saturated colors and delightful and uplifting still life scenes. Here as we see a setting of special treats, to entice the senses of taste and that is also pleasing to the eye. This tapestry "A Date To Remember" is backed with a lining and has a tunnel for easy hanging. Note: tapestry rod and tassels, where pictured, are purchased separately. Dimensions: W 53" x H 62"